They thought they were going to an engagement party. There are all sorts of ways to get married, but while many still choose to go the traditional (read: expensive) route, others prefer to tie the knot in more unconventional ways. Melissa and Brandon Lauzon are one such couple. 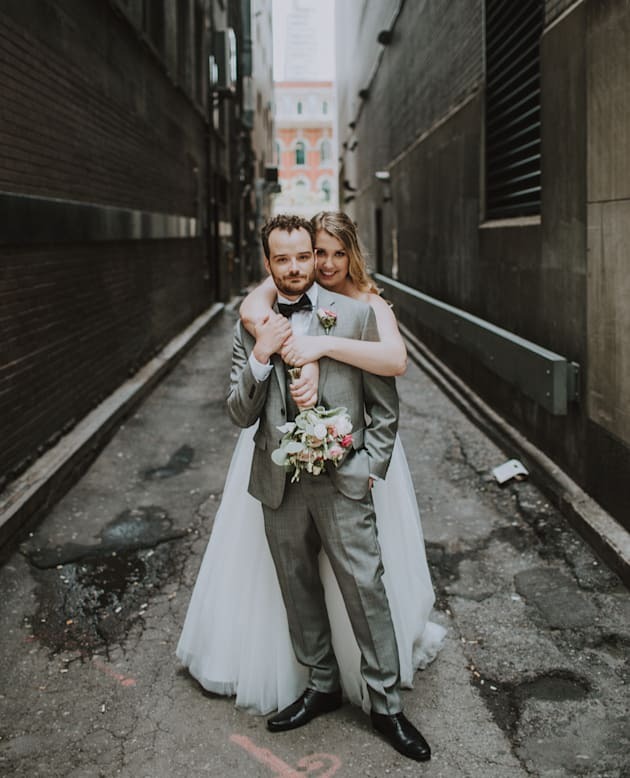 For their wedding on June 10, the Torontonians tricked their families into attending an engagement party at Hot House Café, but upon arrival, the guests were surprised with a ceremony instead. "Surprised is an understatement!" Alyssa Janzen, a close friend of the couple, tells HuffPost Canada of her reaction. "I walked into what I thought was an engagement party, and started to chat up Brandon's parents, whom I had just met. After realizing I might have missed a key detail, my friend Kirsten brought me over to read the sign that explained I was at Melissa and Brandon's wedding!" That's right. 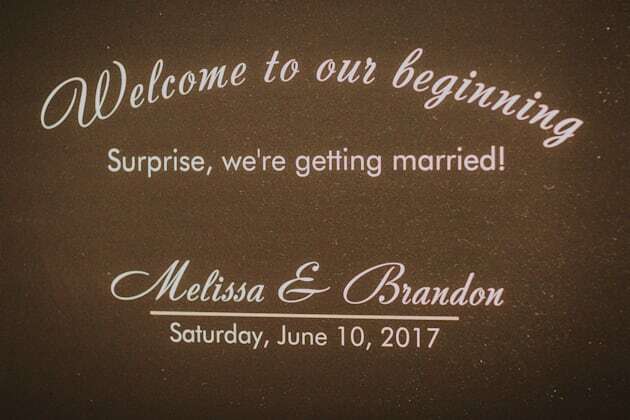 Melissa and Brandon weren't even at the venue when their guests arrived. 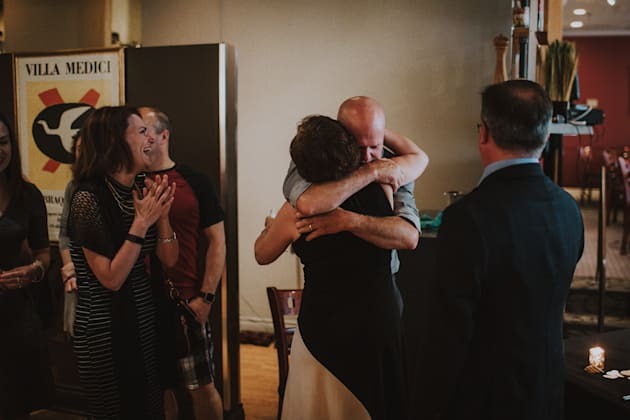 Instead, their family and friends were greeted with the sign above, and the couple's photographer Mario Caputa, of Avangard Photography, captured their candid reactions. 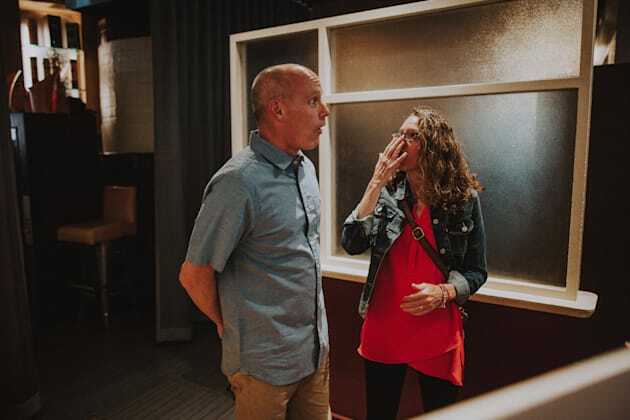 The father of the bride, Eric, and the mother of the bride, Michele, reacting to the news. Kirsten, the maid of honour, showing the couple's friend Alyssa the sign that announced the wedding. Brandon's aunt and uncle, Terry and Jen, reading the sign. Eric, the father of the bride, sharing a hug with Jackie, the mother of the groom, as Karen, the stepmother of the bride, and Troy, the father of the groom, watch on. "Our extended family thought it was such a cool idea. It was such a fun wedding," Melissa says. "My uncle showed up in shorts and was really embarrassed for a bit, but he looked great and he was comfortable. You know, what people were wearing wasn't important to us. We just wanted people there to celebrate and I think walking into that room and realizing what was happening was very emotional for everyone." The newlyweds agreed that keeping everything a secret was the hardest part about planning their wedding. After all, not only did they keep mum about the ceremony, but they didn't announce their engagement until six months after it happened. The Lauzons initially got engaged in September 2016, but told their friends and family that Brandon proposed in March. The only people who actually knew about the couple's plans were the people in their wedding party. Left to right: Justin, Kim, Brandon, Melissa, Kirsten, Dan and Amber. "My best friend Kirsten, the maid of honour, she's known since the beginning," Melissa explains. "She and I are both event planners, so I really needed a partner-in-crime to help me pull this off." The couple then told Brandon's best man, Dan, about "halfway through the process." 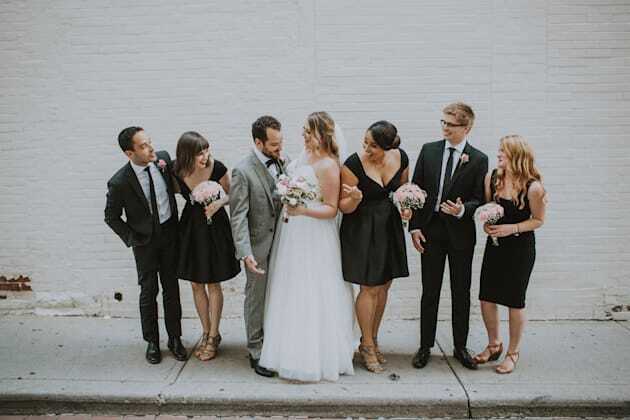 "We told him end of January and then the other people in the bridal party got told after the engagement, about two months before the wedding," Brandon explains. 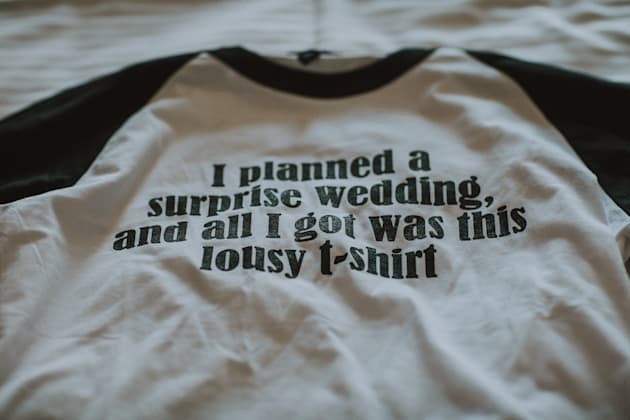 The matching T-shirts the couple gave their wedding party at the rehearsal dinner, which was a hotel pizza party. To trick their friends and families, Brandon told everyone he was throwing Melissa a surprise engagement party. "The hardest thing for me was getting rejections from them and knowing that oh, they're not going to be at the wedding, and coming back to Melissa and having discussions on should we tell these people because now they've said that they are not going to come," Brandon explains. But in the end, "we stuck to our guns," he says. The only person the couple ended up telling was Melissa's brother, who is in the military and stationed at Camp Shilo in Manitoba. Unfortunately, he was unable to take leave for the wedding, but the Lauzons managed to livestream the ceremony for him on YouTube so that he could still be a part of their wedding day. The Lauzons knew right from the get-go that they wanted to buck tradition. "We wanted to do something a little differently," Melissa says. "We still wanted a party with our family and friends, we just wanted to find a way to throw a party without all of the stress and expectation that normally goes into planning a wedding." We just wanted to find a way to throw a party without all of the stress and expectation that normally goes into planning a wedding. 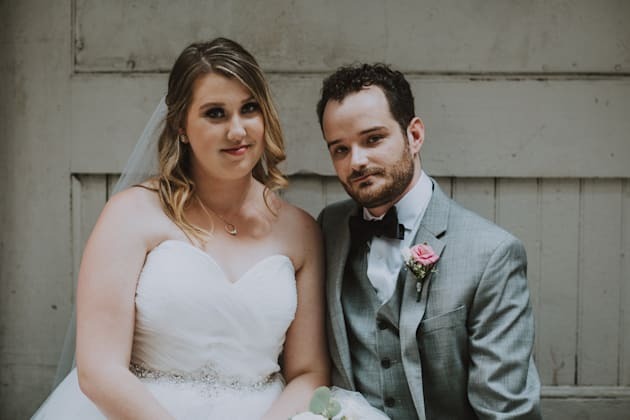 Initially, the couple thought about eloping, but decided against it because they didn't want the closest people in their lives to miss out on this important milestone. That's when Melissa brought up the idea of a surprise wedding to Brandon. 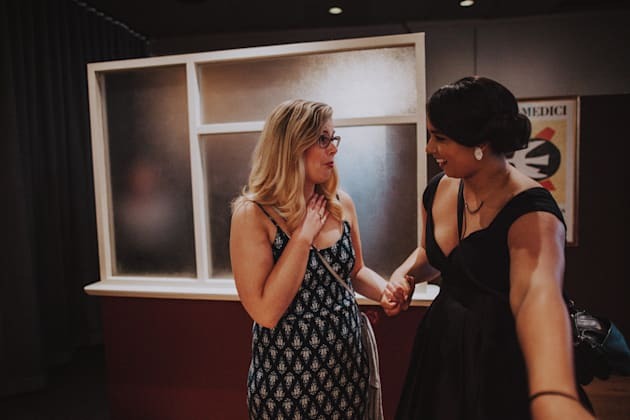 "I actually have a friend [who] went to a surprise wedding a few years ago, and I remember her coming down to visit because the wedding was close to where we lived," Melissa explains. "When she came to meet up with me afterwards, she told me, 'You'll never believe it. It was a wedding! They surprised everybody and everyone was dressed super casually. It was hilarious. We had an awesome day.'" Melissa and Brandon on their wedding day. Having a surprise wedding allowed the Lauzons to have the unconventional wedding they always wanted, but with traditional aspects thrown in. 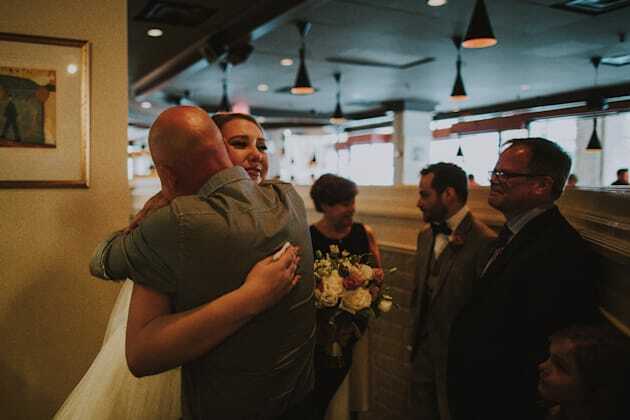 For instance, Melissa knew she wanted her dad to walk her down the aisle, while Brandon definitely wanted to share a special dance with his mother. "We wanted to give [our families] a little bit of what a traditional wedding would have been because I feel like taking all of that away from them would have been unfair," Brandon says. "So we kind of just gave them little pieces of that to make them still feel that they were a part of something." Father of the bride, Eric, giving away his daughter. Recalling the wedding, Melissa says, "I feel like we shared most of our best moments with our parents that night." In fact, one of the highlights of the night for the bride was a moment shared between her dad and stepfather. "I feel like we shared most of our best moments with our parents that night." "My dad didn't wear a tie and he was a little upset that he wasn't dressed for the occasion," she explains. "He was wearing a nice shirt, but he didn't wear a tie, and my stepdad actually offered him his tie to walk me down the aisle." This was a significant gesture since both men are "not normally friendly with each other," Melissa says. 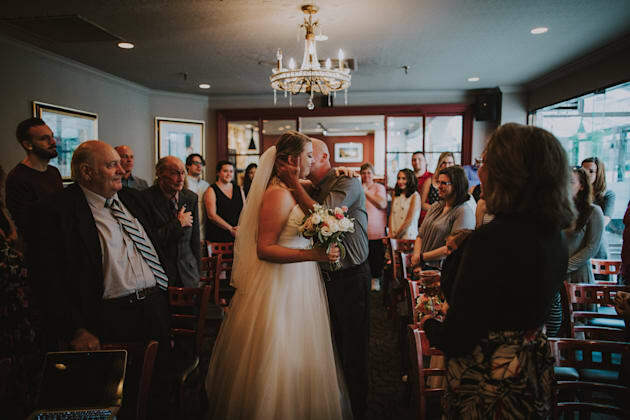 And although her father respectfully declined, the bride notes that "it was just really touching to see them put [their differences] aside for us that day." In total, Melissa and Brandon surprised 35 friends and family members with their wedding. The couple's parents in particular "had the time of their lives." But while the wedding was a success, Brandon does admit they were worried about people's reactions. "We were very nervous that they would react oppositely, like they were cheated out of an experience," he says. 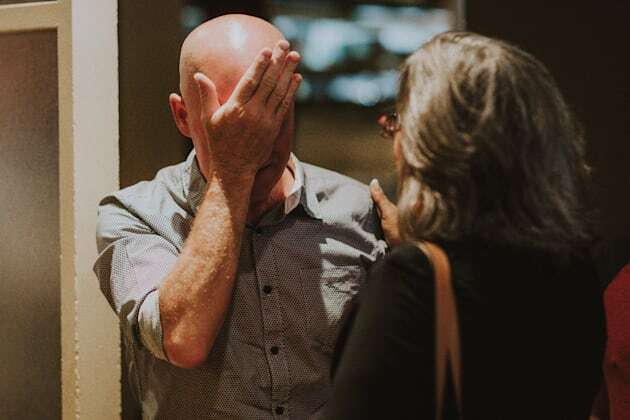 However, if there were any negative feelings, Brandon says they were squashed pretty quickly after the ceremony, as happiness levels only rose as the night went on. Melissa and her father, Eric, just before the ceremony. "I think the bottom line is that [our parents] were just really proud that we chose to get married the way that we wanted to and didn't succumb to any pressure," Melissa explains. "That being said, they didn't really pressure us to begin with." Although it's been three weeks since they tied the knot, the Lauzons say they're still on a wedding high. "It was just one of those great nights where everything kind of lined up exactly the way we wanted it to. And it just made for an amazing atmosphere," Brandon says. "I wouldn't take anything back." You're never going to please everyone anyway so you might as well take a risk and do something that's going to make you happy. "I hope that every bride feels as excited about their wedding night the way that we still feel excited about ours," Melissa adds. When asked what advice they have for couples hoping to plan their own non-traditional wedding, the couple agreed that you just have to follow your heart. "When you find a wedding that will make you happy as a couple, I think you gotta stick to your guns and go for it," Melissa says. "You're never going to please everyone anyway so you might as well take a risk and do something that's going to make you happy."